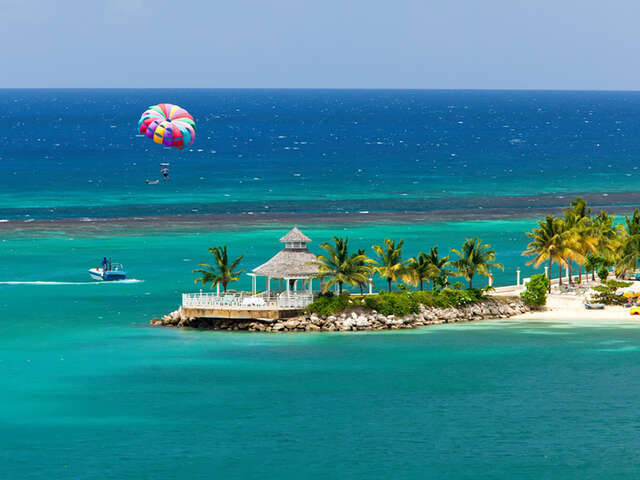 The Couples Tower Isle is an iconic Jamaican resort that exudes a cozy and chic sophistication of Caribbean sensuality. The resort is a glamorous, all-inclusive retreat that features the sweeping views of the sea and a private white sand beach. The Couples Tower Isle is an iconic Jamaican resort that exudes a cozy and chic sophistication of Caribbean sensuality. The resort is a glamorous, all-inclusive retreat that features the sweeping views of the sea and a private white sand beach. It is the place to discover why windsurfing and snorkeling are the most popular watersports given that the sea near the beach is rich in coral reef Eco diversity. Guests swear that enjoying a tranquil evening by the beach is what Shakespeare had in mind when he was writing his masterpieces. Guests also get to enjoy a round of golf or a game of tennis that makes for good holiday camaraderie. The food served at the restaurants showcases the culinary genius of the Jamaicans as does the award winning cocktails served in the bars. Accommodations at the resort leave nothing to chance. Every room is customized to suit the luxury needs of the guests. The rooms available are classified into; Deluxe Garden, Superior Ocean, Deluxe Ocean, Premier Ocean, Garden Junior Suites Ocean Junior Suites and One Bedroom Ocean Suite. Note that all rooms are fitted with amenities such as 360 degrees views, air conditioning, Ceiling fan, IPod docking stations, iron and iron board, king-size beds, complimentary personalized minibar, nightly turn down service, coffee make, electronic safe, hair dryer, flat screen satellite TV among others. For your dining needs, visit the Cassava Terrace for a breakfast made of omelets and tea, Beach Grill for grilled food and salads, Lychee for a sample of Asian food, and Otaheite for the best Caribbean cuisine. You can make a request for private beach dining, candlelit dinner or in-room dining. Water Activities - swimming, scuba diving, snorkeling, kayaking, wind surfing, beach volleyball and football, paddle boards, waterskiing etc. Offsite Excursions - These include; trip to Sunset Bar, glass bottom boat tours, shopping tours, unlimited golf, sunset catamaran tours etc. Fitness Activities - These include; yoga, pilates, power walk, kick boxing, tennis and other land sports and attending a fully equipped gym. On property activities - These activities include; nightly entertainment, dance classes, sing-alongs, nature walks, volleyball and massages and body treatments in award winning spa. For those looking for the best spot to hold a wedding, how about a sunset wedding on the beach at the resort? You can leave the arrangements to the professional event organizers at the resort. Couples Tower Isle is a holidaymaker's haven and you will be one of the few lucky ones that will have a chance to stay there in their lifetime. Click here to see what others are saying about the resort of Trip Advisor.